In a complete letdown from his previous outing, left-hander Henry Owens did not throw a no-hitter. However, a case can be made that he was better than he was in his Opening Day no-no, as he tossed 6 2/3 shutout innings while allowing six hits (five singles and a double). For the second straight outing, he recorded nine punchouts, but this time, he did not issue a walk. He elicited 13 swings and misses on his changeup alone, and 25 overall among his 83 pitches (59 strikes, a whopping 71 percent rate). A few milestones and notable takeaways from the performance: 1) The 6 2/3 innings matched his longest outing in Double-A. 2) This marked the fifth start of his career, and first of more than five innings, in which he didn't permit a walk. 3) The nine strikeouts were tied for the fifth most of his career Owens' line in Double-A in his first two starts: 12 2/3 innings, 2-0, 0.00 ERA, 18 strikeouts (12.8 per nine innings), 2 walks (1.4 per nine innings), opponents line of .140/.178/.163. Owens' line in 8 total starts in Double-A between this year and last: 43 innings, 5-1, 1.26 ERA, 64 strikeouts (13.4 per nine innings), 17 walks (3.6 per nine innings), opponent's line of .159/.253/.258. All of this will start the drumbeat: When will it be time for the Red Sox to move Owens up to Triple-A to challenge him? Of course, the decision isn't one made in a vacuum. With Brandon Workman joining the Pawtucket rotation and Matt Barnes (who threw 3 2/3 innings in Fort Myers on Wednesday, and is likely to get one more start in extended spring training before joining Pawtucket, perhaps at the end of next week or early the following one) expected to do the same in the not-too-distant future, the PawSox rotation is already loaded with guys for whom innings are a priority, with Workman and Barnes joining Anthony Ranaudo, Allen Webster and Rubby De La Rosa. That group represents five of the Sox' 10 top prospects in the minor leagues right now. As such, a spot for Owens in Triple-A would require one of the other rotation members to be either a) promoted to the big leagues; b) injured; or c) traded. But given the nature of pitcher attrition, there's a very good likelihood that A or B come to fruition sometime early in the season. And with that, an early-season promotion for Owens -- perhaps about a month into the season -- would be very realistic. That's not to say that he's already mastered the level (even though the results certainly make it look like he has). His fastball command, movement and deception make that offering an above-average pitch, and his changeup looks like a well above-average pitch. He needs to sharpen his breaking ball, and while he's shown considerable progress in his walk rate this year, he did walk 4.5 batters per nine innings in Portland at the end of last year, so the Sox need to make sure that his command and control gains are real. So a promotion isn't imminent. But it's also not too distant a conversation if Owens sustains his current level of performance, at which point the next conversation -- about his proximity to the big leagues -- will start to take shape, though the Sox hope to make sure that they don't cut corners in sweeping the lefty up to the big leagues. "There's some things for him to do still at the minor league level, despite the start he's off to, and he knows that," Red Sox GM Ben Cherington said on WEEI's Dennis & Callahan show on Thursday morning. "He got a little taste of Double-A last year. We started him there this year. We wanted to give him at least a few more starts there. There's probably going to be some Triple-A time in his future before he sees the big leagues. ... He's a guy we think can be a major part of our rotation moving forward, so we want to be careful that we finish off his development as much as we possibly can." Still, while the Sox don't want to rush the conversation about Owens' next move up the ladder, there also come points in a pitcher's development where he can force the conversation rather than sticking to a template. "Guys are in Double-A for a reason, and there'Â€Â™s still a lot of development there and maturing," Portland manager Billy McMillon told the Portland Press-Herald. "Suffice it to say, I think he has a lot of upside. You could close your eyes and see him pitching at higher levels, but he'Â€Â™ll get there when he gets there. If he keeps having outings like this, he'Â€Â™ll probably open up some more dialogue about what'Â€Â™s going to happen a month from now." TRIPLE-A PAWTUCKET RED SOX: 7-0 LOSS VS. SYRACUSE (NATIONALS) (BOX) -- Right-hander Anthony Ranaudo got hit hard in 5 2/3 innings of work, permitting five runs (four earned) on seven hits -- four singles, a double, a triple and a homer -- while walking one and striking out four. He did attack the strike zone, with 62 of his 94 pitches (66 percent) going for strikes, and after getting hit hard early (5 runs before he recorded his second out of the third inning), he then settled to shut out Syracuse over his final 3 1/3 innings. -- Right-hander Dalier Hinojosa, signed last October to a minor league deal with a $4 million bonus after defecting from Cuba last year, continued to struggle with his control at the start of his pro career. He did not allow a hit but walked four to force in a run, and the fact that he also committed a balk in his inning of work suggests that there are still adjustments to the pace of the game in the States that are taking place. In three appearances spanning 4 2/3 innings, opponents are just 1-for-15 (.067) against the 28-year-old but with a .364 OBP due to seven walks (against four strikeouts). -- Third baseman Garin Cecchini went 0-for-4, his first Triple-A game in which he did not collect a hit (and, for that matter, in which he did not reach base). DOUBLE-A PORTLAND SEA DOGS: 9-2 WIN AT TRENTON (YANKEES) (BOX) -- Feats of Mookie: Revving the on-base machine. Mookie Betts (serving as DH) went 2-for-5 with a walk, and he's now reached base in each of his first six games in Portland while getting on multiple times in five of his first six contests this year. In 28 plate appearances, the 21-year-old is hitting .458/.536/.708 with four extra-base hits, four walks and two strikeouts. Betts also stole his second base of the season on Wednesday. -- With Betts at DH, Sean Coyle made his first start of the season at second base (the only position he'd played in the minors until moving to third this season), went 2-for-5 with a double. The 22-year-old did, however, also punch out a pair of times, and he's struck out at least once in each of his first five games this year, with seven whiffs on the season to date. HIGH-A SALEM RED SOX: 4-2 LOSS VS. WINSTON-SALEM (WHITE SOX) (BOX) -- Salem's loss ended a 16-game, 224-day unbeaten streak that dated to last year. 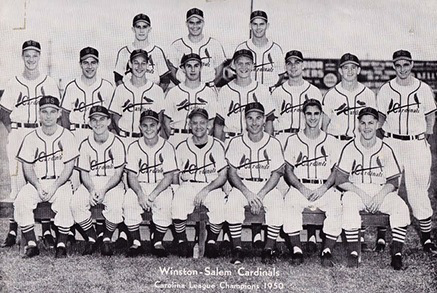 The team's run will go down in Carolina League annals as being tied for the longest winning streak in league history with the 1950 Winston-Salem Cardinals. For what it's worth, the most notable big league player on that Winston-Salem team proved to beÂ Vinegar Bend Mizell, who made one All-Star appearance in his big league career. However, that team also featured an undersized, 19-year-old second baseman who would go on to one of the greatest managerial careers of all time:Â Earl Weaver. (In this photo, he's the one who looks like the bat boy, third from the left in the front row.) -- In defeat, starter William Cuevas, 23, punched out eight and walked one while allowing three runs on five hits in five innings. Cuevas, who was 8-9 with a 5.05 ERA last year, is 1-1 with a 2.45 ERA, 11 strikeouts and just one walk in his first two starts of this season. -- First baseman/DH David Chester, who hit 19 homers last year, went 1-for-3 with a tape-measure home run. "Probably one of the longest homers I have seen in 20 years. I still can'Â€Â™t believe how far that ball went," manager Carlos Febles told the Roanoke Times. SINGLE-A GREENVILLE DRIVE: 6-3 WIN AT CHARLESTON (YANKEES) (BOX) -- Outfielder Manuel Margot, viewed as one of the highest-ceiling players in the Sox system as an up-the-middle position player with five tools, launched a pair of homers as part of a 3-for-4 day. Though the 19-year-old went deep just once last year, the Sox view him as a player with the ability to drive the ball with above-average power for a center fielder, with double-digit homer totals and plenty of doubles a baseline for his potential; some believe he could emerge as a 15-20 home run hitter with above-average defense, speed, the ability to hit for average and slugging while posting respectable OBPs. "He's going to have some juice at the plate," said Red Sox minor league hitting coordinator Tim Hyers in this edition of the Minor Details podcast. "It's not going to be his sole tool or best tool. I see him as a gap-to-gap hitter with sneaky power to the pull side. When mistakes are made, he can knock it out of the park. I think he's going to live on a lot of line drives, utilize his speed to create those into doubles, but he's another guy who, the ball sounds really good coming off his bat in batting practice. He has a high ceiling. It's just a matter of watching him grow -- how much bigger does he get? how much stronger will his body fill out? -- but he's definitely got the quickness and athleticism to be an excellent hitter." The fact that he's in Greenville at 19 points to the fact that the Sox believe he has the talent and aptitude to be pushed on an aggressive developmental path. Days like Wednesday underscore why the organization harbors such belief. Margot did get picked off, but he had an outfield assist in starting a relay that resulted in a runner being thrown out at the plate. -- Shortstop Tzu-Wei Lin went 2-for-4 with a pair of singles and a walk. The 20-year-old shortstop is hitting .467/.571/.467 to start the year. -- Left-hander Cody Kukuk needed 72 pitches (41 strikes; 57 percent) to work through three innings. He allowed four hits, including a double and a homer, while striking out five and walking two. -- Left-handed reliever Mike Adams punched out a pair of batters in two innings. The 23-year-old, who was drafted out of the University of Tampa last year, now has eight strikeouts and no walks in four innings spanning his first three appearances of the season.